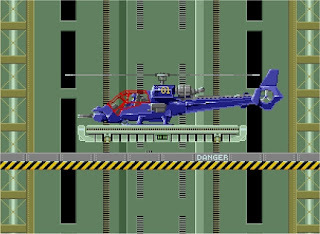 'Super Thunder Blade' has been described as 'OutRun' in a helicopter. But while there's an awful lot of love for the racing game why does no one care for this shooter? Growing up Yuji Naka was fascinated by electronic music and then later by the emergence of arcade games. He not only played every game he could, he analysed them, trying to figure out how they worked. Naka eventually learned how to program by replicating and debugging video game code printed in magazines, studying assembler language and code writing. Given Japan's cultural emphasis on a good education, this technical genius defied conventions by turning down guaranteed university placement. Naka felt four years at university would be a waste when the games industry was unfolding about him. Instead he moved to Tokyo and applied for employment with Namco who at the time the world's leading arcade game company. His lack of a degree hampered any chance he had though and Namco did not offer him a job. Undaunted, he continued to shop his talents around and in 1984 found himself working as an entry-level coder at Sega. However, the job title was not a reflection of what he was really doing. "Not just programming," Naka would comment many years later, "everything...the graphics, the pictures, everything." Over the next seven years, Naka's programming excellence demonstrated itself in a number of impressive arcade conversions for Sega's SG100 and the Mark III / Master System. “There weren't many employees at Sega at the time - most teams consist of just five members" Nara recalls. "We were all working on new things. It was a very rewarding and enjoyable job". His credits during this period include such legendary titles as 'OutRun' and 'Space Harrier' which he managed to faithfully bring to Sega's earlier consoles; something considered technically impossible without huge compromises on the gameplay. This alongside Naka's work of the first ‘Phantasy Star' game caught the attention of former Sega president Hayao Nakayama who called Yuki Naka "Sega's Miyamoto". In 1988 Naka and his team were tasked with developing software for the upcoming Mega Drive console. Naka was now a producer and 'Super Thunder Blade', a port of an arcade game, would become one of the system's two launch titles. Unfortunately and embarrassingly for this programming prodigy, 'Super Thunder Blade' was greatly inferior to 'Space Harrier II'. New Mega Dive owners buying both day-one games would have felt disappointed with the one baring Yuji Naka's pseudonym. 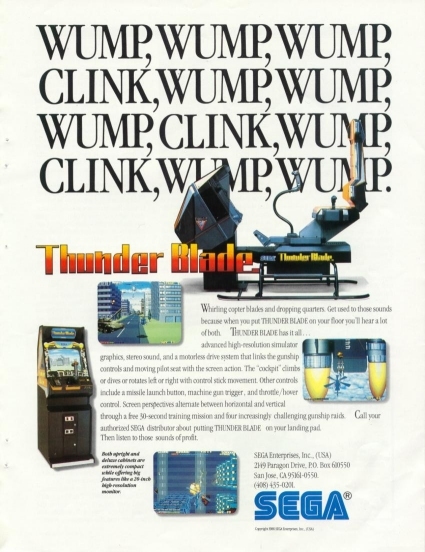 'Super Thunder Blade' was certainly not a good advert for the capabilities of Sega's new hardware, nor was it much of an endorsement of Naka's ability as a producer. In the arcade 'Thunder Blade' is another example of a Sega Super Scaler. This graphics technique was designed in 1985 by Yu Suzuki, initially for 'Hang On' but countless similar games followed. These arcade machines had graphics boards capable of scaling hundreds of sprites every second, allowing for characters, items, or hazards to smoothly grow or shrink as the game demanded. It was a popular technique used to create faux-3D games, as the visual illusion gives the player the impression they are travelling into the screen. Some of Sega's popular Super Scaler arcade games include 'Space Harrier' , 'OutRun' and 'After Burner' and for these games a player would sit in a huge moving cabinet. 'Thunder Blade ' was the seventh in this “physical experience” arcade game series, released in 1987. The cabinet introduced the use of force feedback, with the joystick vibrating during gameplay. To add even more immersion a sit in unit was also released, replacing the force feedback with a seat that moves in tandem with the joystick. Each technological addition made 'Thunder Blade' less a game and more a thrill ride, which in some ways masked the fact that the core gameplay was very similar to past Sega titles. Inspired by the 'Blue Thunder' TV series and film, a player controls a blue helicopter called Thunder Blade. 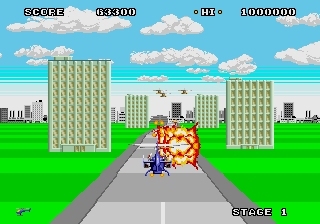 According to information provided to amusement arcade owners "your mission is to destroy the evil machine [by] flying your chopper through different stages of combat. Over land, you fly through a city, canyon or industrial zone obliterating enemy choppers and tanks. Over water you destroy boats, ships or fighter planes." Levels alternate between top-down and third-person perspective gameplay with the latter playing like a rail shooter making full use of the Super Scaler technology. According to Sega, "as far as arcade hardware is concerned, the game ran on the same X-BOARD utilized by 'After Burner’, featuring the same dual MC68000 and single Z80 processors, allowing for 256 sprites on the screen at once, with specialized scaling hardware." It was the Super Scaler levels that were the undoing of the Mega Drive port as shockingly the console lacked a graphics chip that would dynamically resize or rotate sprites. This is somewhat surprising given that Sega went to great lengths to point out that their home console would provide "the arcade experience at home". With the prevalence of Super Scaler arcade games you would think that any Sega home-hardware would be able to easily replicate them. Indeed both of the launch games; 'Space Harrier II' and 'Super Thunder Blade' needed to rapidly scale many sprites simultaneously. 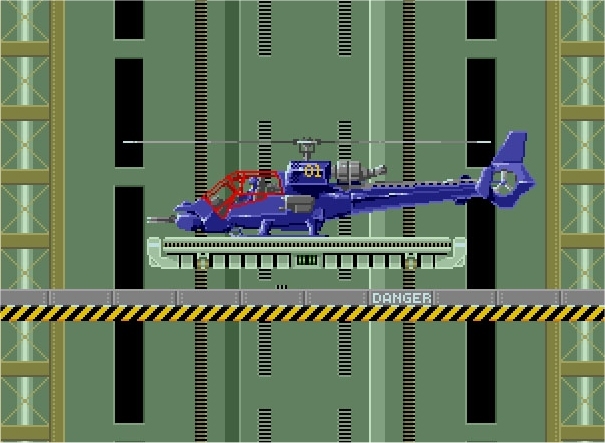 Yuji Naka had to think laterally to recreate the impressive arcade helicopter game on the Mega Drive hardware. "Since it was a Mega Drive launch title, 'Super Thunder Blade' got a lot of attention" remembers modern Sega Producer, Yosuke Okunari. "Yuji Naka [...] banged it out in about three months. Around this time, there was a pretty big gap between arcade machines and home consoles like the Sega Mark III and Mega Drive. It was a time when arcade ports played starring roles on the home console line-ups [and] people were really curious how that "physical experience" could be recreated at home." With the absence of sprite scaling hardware Naka and his team turned towards the Mega Drive's fast CPU but the results were far from satisfactory. "Back in the late 1980s, Sega was all about using 2D graphics to make three-dimensional shoot-'em-up games" Game Spot noted in a retrospective article. "'Super Thunder Blade', became a choppy, nearly unplayable mess when it was later ported to the Sega Genesis". Buildings seem to fluctuate in size, pop up suddenly and become horribly pixelated when close. It was something Electronic Gaming Monthly also pointed out upon release, noting that "oncoming objects increase in size in coarse steps". Reviewing the Virtual Console digital release of 'Super Thunder Blade' the 1up website was particularly harsh. 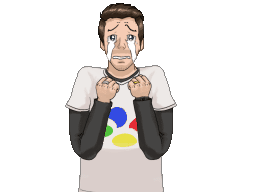 "You have to hand it to Sega: they certainly tried to bring their amazing Super Scaler technology to home consoles. The 3D effects are well-intended, but don't quite work the way they should." Buildings in the Mega Drive version have no depth, looking like cardboard cut-outs that you fly past. However Sega could hardly claim that four sided buildings were impossible on home machines when other people had achieved it on rival systems, many of which were significantly less powerful than the Mega Drive. 3D buildings are seen on the ZX Spectrum, Amstrad, Atari ST and Amiga version of 'Thunder Blade'. Most embarrassing they're even present on the Master system version; the very machine that Sega was trying to surpass with its new hardware. 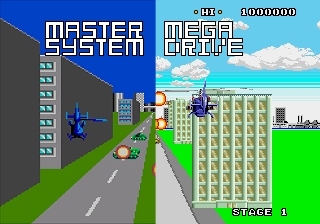 Despite not being able to visualise the sides of buildings, the Mega Drive does manage to crowd the screen with more enemy projectiles than can possibly be avoided. 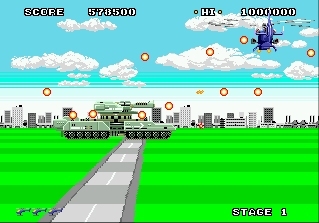 However it doesn't present a challenge akin to a bullet hell shooter, as often a missile will appear directly in front of your helicopter with seemingly no way to avoid it. There never seems to be a predetermined safe route through a stage so it's not even a case of pattern memorisation. As your helicopter can only withstand one hit, death is frequent, random and often through no fault of the player. The flat surrounding buildings simply don't allow enough space to safely pass through a stage. "Every moment is an exercise in frustration as you try to avoid enemy projectiles without the necessary sense of scale and depth to determine where in space each hazard is" claimed the 1up website. "['Super Thunder Blade' is] not recommended, unless you just like being angry for some reason". Some however believed the arcade version of 'Thunder Blade' itself was hard even before the difficulty was made worse by the Mega Drive's unresponsive controls and inconsistent refresh rate. "In the original, if you hit something you would just crash and lose a life" laments Sega Producer, Yosuke Okunari. "This was one of the reasons 'Thunder Blade' was so hard - compared to 'After Burner’ there were also obstacles in the background that you had to avoid as well. And they are hard to dodge, which I think was exacerbated by the tricky controls." Thankfully at only four levels long 'Super Thunder Blade' is short and adapt patient Mega Drive players could finish it in 20 minutes. It isn't a pleasurable 20 minutes of course; with a nonstop crescendo of badly synthesised explosions drowning out the abrasive irritating music. 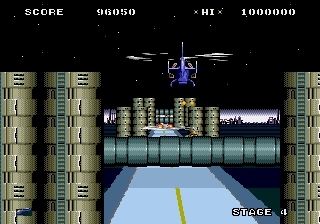 Despite the addition of “Super” in the title, the Mega Drive version of 'Thunder Blade' is actually a scaled back version of the arcade original. Sold as a sequel you'd presume it's an enhanced follow up but there is actually less in it than other home ports. There may be a new animated intro to each level but it's hardly a substitute for a cut level at the start of the game. It would never be considered the best home version of 'Thunder Blade' and as a show case for the powers of a new console 'Thunder Blade' is a woeful launch game. "The sprites [in the Mega Drive port] are half decent but to be brutally honest if someone told you this was the Master System version you probably wouldn’t even question it" claims popular gaming critic Damien McFarren. Even Sega themselves seem ashamed of the game and modern producers are less complementary about Yuji Naka's efforts. "Many of SEGA’s ports made valiant efforts to recreate the arcade experience, but not all of them were successful. Sometimes the attempts just left you with a vague feeling of sadness" laughs Yosuke Okunari. Thankfully Naka will go on to do much better work and in many ways 'Sonic the Hedgehog' wouldn’t exist without him. Sega did include 'Super Thunder Blade' on a number of compilations, but it's telling that few speak fondly of the game. When the Mega Drive version of 'Thunder Blade' was recently released on digital platforms reviewers were universally negative and seemingly any nostalgia for the Mega Drive's first game has long gone. "With launch software like this it’s little wonder that the Mega Drive struggled to gain any kind of foothold in Japan" criticise McFarren. "Thankfully by the time the console arrived in the West the catalogue of games was more impressive and tripe like this was quickly forgotten." When you buy games in bulk you typically have to live with games you wouldn't have bought if they weren't included. 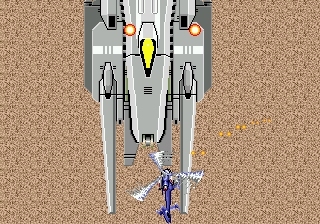 'Super Thunder Blade' is one such game, included as part of a compilation. When all is said and done it's a very hard but mercilessly short game that JUST about keeps it interesting enough to struggle on trying to complete it, and by doing so I found myself liking the game more now than I did back in the 90's where I could never be bothered putting the time and effort in to playing it.